Banc de Binary is a binary options broker that has been active since 2009. It was also one of the first binary options brokers to be regulated, in this case by CySec. Banc de Binary offers several different ways to trade binary options. It also offers a variety of educational information and has a 24/7 customer service, never a bad thing in today’s fast-paced world. The minimum deposit is $250 and the welcome bonus an instantly available 25% over your first deposit. Banc de Binary is relatively generous when it comes to bonuses compared to some other binary options brokers. This is mainly because they not only offer a 25% welcome bonus on the first deposit but also regularly come out with a reload bonus for existing clients, for instance when important economic events are on the roll. Traders that deposit regularly are also offered a reload on a frequent basis. The bonuses are instantly available for trading, but you do have to ‘free’ it by trading before you can cash it out. That means you have to trade a volume of $20 for every $1 in bonus. So if you open a binary option position of $100, you free up $5 of bonus available for cash out. These trading requirements are better than average, since most brokers require a volume of 30x or 40x. Digital Options Pro, whereby all options expire after 15 minutes. If you wish you can be notified by email of the status of the trade. The Options Builder, meant for more experienced traders, because it allows for more customization. Think run time, risk level and of course also what kind of tradable asset. It is also possible to add an insurance when during run time of the option you think the chances for the option to expire in the money have declined. One Touch Platform, which is about the asset reaching a specific strike price. If you’re right, the payout can go as high as 500%. 60 Seconds, for binary options with a run time of only 60 seconds. Fun (for some) and can have its uses when an asset is in the middle of a rally or free fall. BinaryMETA, allowing you to sell your binary option before expiration or double down on one that is going in the right direction. 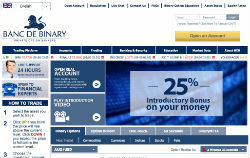 Banc de Binary also offers a demo account, but only after you have first deposited a minimum of $250. If you wish you can still withdraw that $250 right away though, BdB simply wants to prevent people who never have the intention of opening a real account from using the demo platform. The minimum deposit at Banc de Binary is $250. Depositing is possible with a credit card, through Skrill (Moneybookers) and by wire transfer. Customer funds are insured until up to $250,000. Banc de Binary does not charge customers for withdrawals. The customer service is available 24/7 through chat, email and phone. Banc de Binary is operational since 2009 and is being regulated by CySec in Cyprus. Banc de Binary is one of the better binary options brokers. It was one of the first binary options brokers that opted for being regulated, offers a decent variety of tradable assets and has a good customer service. Another advantage is that BdB does not charge customers for withdrawals, unlike several other brokers. We did not like the fact that you have to open a live account and deposit $250 first before you can use the demo account though. After all, it is always nice to try before you buy, even if you can cash out the $250 right away. The bonus BnD offers is better than those of most binary option brokers, notably because of the frequent reload bonuses. All in all, Banc de Binary is a good option for those willing to deposit right away.